Guzman, 61, was found guilty on all 10 counts at his high-profile drug-trafficking trial at a federal court in New York on Tuesday. Guzman was convicted of all 10 counts of a superseding indictment. The conviction of Mexican drug lord Joaquin "El Chapo" Guzman in all 10 criminal charges against him clearly demonstrates that the US will not tolerate those who bring drugs and violence into the country to destroy people's lives, America's drug czar Uttam Dhillon has said. The Mexican, famed for his brazen escapes from Mexican prisons, was accused of being behind the all-powerful Sinaloa drug cartel, which prosecutors say was the biggest supplier of drugs to the US. He was convicted on numerous counts including the distribution of cocaine and heroin, illegal firearms possession and money laundering. In 2009, Guzman entered Forbes' list of the world's richest men at number 701, with an estimated worth of USD 1 billion. While Guzman will be sentenced on June 25, he faces a mandatory life sentence without the possibility of parole for leading a continuing criminal enterprise, and a sentence of up to life imprisonment on the remaining drug counts. After jurors left the room, Guzman waved and smiled at his wife, Emma Coronel, a former beauty queen and courtroom regular who smiled back and touched her hand to her heart. Guzman was arrested in January 2016 after escaping from a Mexican prison through a tunnel five months earlier. He was extradited to the US in 2017. The Acting Administrator of the US Drug Enforcement Administration (DEA) Dhillon said Guzman's conviction demonstrates the dedication and determination of the men and women of the DEA to bring the world''s most dangerous and prolific drug trafficker to justice. "Those who bring drugs and violence into the United States that destroy lives and communities will not be tolerated, nor evade our reach," the prominent Indian-American White House lawyer who was appointed in July last year, said. "The success of this case is a testament to the strength of our relationship with our Mexican counterparts. The DEA will continue to pursue justice worldwide and protect Americans," Dhillon said. 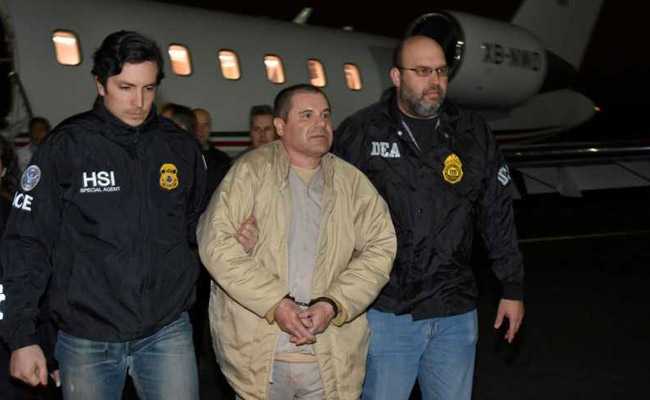 A federal jury in Brooklyn convicted Guzman of being a principal operator of a continuing criminal enterprise - the Mexican organised crime syndicate known as the Sinaloa Cartel - a charge that includes 26 drug-related violations and one murder conspiracy. Guzman was convicted of all 10 counts of a superseding indictment, including narcotics trafficking, using a firearm in furtherance of his drug crimes and participating in a money laundering conspiracy, the Department of Justice said in a press release. The verdict followed a 12-week trial, the court was told that Guzman oversaw the smuggling of narcotics to wholesale distributors in Arizona, Atlanta, Chicago, Los Angeles, Miami, New York, and elsewhere. The billions of illicit dollars generated from drug sales in the United States were then clandestinely transported back to Mexico. Guzman Loera also used "sicarios" or hit men, who carried out hundreds of acts of violence in Mexico to enforce Sinaloa's control of territories and to eliminate those who posed a threat to the Sinaloa Cartel, the statement said. Reacting to Guzman's conviction, Acting US Attorney General Matthew Whitaker said it was clear to the jury that the Mexican drug kingpin''s massive, multi-billion dollar criminal enterprise was responsible for flooding the streets of the United States with hundreds of tonnes of dangerous drugs. "This case demonstrated the extraordinary reach of the US government, our tenacity and commitment to pursuing kingpins like Guzman whom - if their power is unchecked - will, like Guzman, develop what for 25 years was an almost unstoppable capacity to move massive quantities of drugs into our country," Whitaker said.